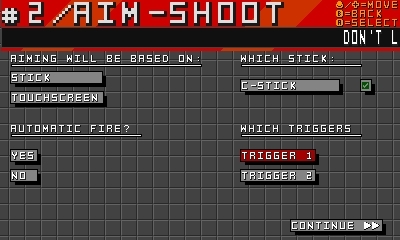 The remake of the most insane shooter have come to SmileBASIC! 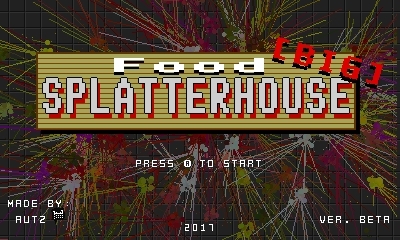 Food Splatterhouse [BIG] is a remake of the previous game of the same name. 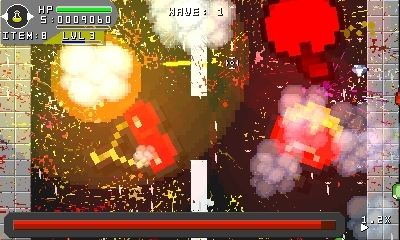 It features the same gameplay style, but in a more clean/polished way, including some changes and additions to it. 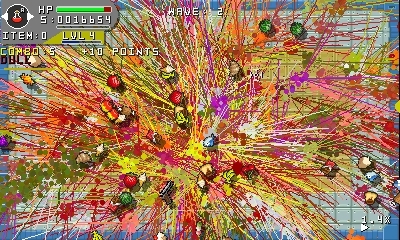 As the original game, you fight against hordes of food that wants to kill you! But this time they are more angry than before, can you match the expectations and survive? 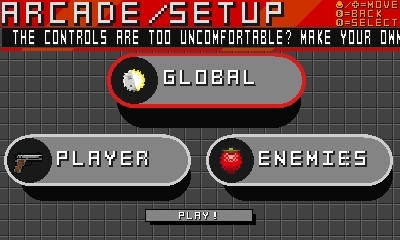 Unlike the original game, this remake contains a lot of new features to enhance the experience, for example: - Custom control schemes - Day/Night variations - Animated maps - Improved visuals And more! There's a lot here, so keep an eye for ay detail! Keep in mind this: This is BETA quality software. Expect some glitches when playing (including the extra games) or messing up with the options. You can report them on the comments so i can keep track of what is going on. And last: Don't forget to visit the official thread! Instructions Download and open "FSBIG" file. 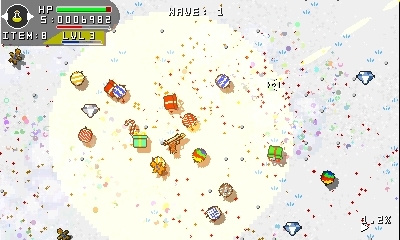 Notes Is evil food, but looks more presentable than previous game. 43 Comment(s) Imasheep Pokemon Is Awesome! I love Pokemon! Express Yourself Night Person I like the quiet night and sleep late. Express Yourself OSP Contest 2 Contest Participant I participated in the second SmileBASIC Source OSP Contest! 1 year ago I found a glitch while using the C stick as main movement (I tried because I am left handed). I can't move up and down. IAmRalsei Forum Leader Hidden Achievements First Year My account is over 1 year old Website Expert Programmer Programming no longer gives me any trouble. Come to me for help, if you like! Programming Strength 1 year ago i tried that because the c-stick is horrible at aiming spaceturtles Video Games I like to play video games! Hobbies Avatar Block I didn't change my avatar for 30 days. Website Intermediate Programmer I can make programs, but I still have trouble here and there. Programming Strength 1 year ago If coded and/or calibrated correctly it can be more precise than the circle pad at times. 12Me21 Syntax Highlighter Received for creating the code syntax highlighter on SBS Night Person I like the quiet night and sleep late. Express Yourself 1 year ago The c stick is wayyyyy more accurate than the circle pad, at least for small precise movements. The dead zone on the circle pad is huge. Imasheep Pokemon Is Awesome! I love Pokemon! Express Yourself Night Person I like the quiet night and sleep late. Express Yourself OSP Contest 2 Contest Participant I participated in the second SmileBASIC Source OSP Contest! 1 year ago Well, it's easier for me to aim with a touchscreen and move with an analog stick. The aiming on it works perfect! it's the movement though. I can't move up and down, and when I move left or right, I go opposite directions.How would I calibrate the C-NubStick? spaceturtles Video Games I like to play video games! Hobbies Avatar Block I didn't change my avatar for 30 days. Website Intermediate Programmer I can make programs, but I still have trouble here and there. Programming Strength 1 year ago It's not exactly a matter of you calibrating it since the system auto-calibrates the lower level stuff. I think I meant calibrated as in using precise values with the output of the command for that hardware but it probably is besides the y-values being incorrect/unavailable and the x-values needing inversion. It's a simple fix if you don't want to wait for an update. Unless the code has a complicated obfuscation-like style. snail_ QSP Contest 1 Contest Participant I participated in the first SmileBASIC Source QSP Contest! Helper Received for being very helpful around SmileBASIC Source Achievements Amazing Contributor Someone thinks I'm an awesome person who has done so much for the community! Achievements Edited 1 year ago I do like C-Stick aiming a fair bit. Unfortunately, my N2DS came with a faulty C-Stick; it seems biased to the upper-left and inputting right-or-down directions results in a very inconsistent and jumpy reading unless I apply a lot of pressure. I haven't used the C-Stick enough yet to really justify the trouble of using Nintendo's repair support (with which I have a very bad history...) and touch aiming also feels pretty good, so I don't know if I will ever send it in, honestly. Imasheep Pokemon Is Awesome! I love Pokemon! Express Yourself Night Person I like the quiet night and sleep late. Express Yourself OSP Contest 2 Contest Participant I participated in the second SmileBASIC Source OSP Contest! 1 year ago Well, I know it is not the C Stick because I have Minecraft (to test out the C-stick and power of the system) And it works perfectly, and Not SB itself, because this doesn't happen with other games. 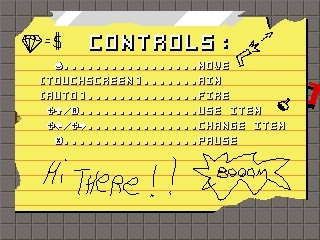 Again, I am a lefty so using my right hand to aim with the touchscreen isn't exactly the most effective SwanBot Halloween 2017 Contest Runner Up I placed 2nd in the SmileBASIC Source Halloween 2017 Contest! Programming Contest Intermediate Programmer I can make programs, but I still have trouble here and there. Programming Strength First Year My account is over 1 year old Website 1 year ago *Raises left hand in show of left handed nation support* Autz64 QSP Contest 1 Winner I won the first SmileBASIC Source QSP Contest! Programming Contest End of 2017 Contest Participant I participated in the SmileBASIC Source End of 2017 Contest! Programming Contest Deep Sleep Hidden Website 1 year ago Well, I really don't know what could be, the code for the c-stick aim is identical to the aim with the normal stick. IAmRalsei Forum Leader Hidden Achievements First Year My account is over 1 year old Website Expert Programmer Programming no longer gives me any trouble. Come to me for help, if you like! Programming Strength 1 year ago you do realize the c-stick is smaller than the normal stick, right? that could be part of the problem MochaProbably Expert Programmer Programming no longer gives me any trouble. Come to me for help, if you like! Programming Strength Night Person I like the quiet night and sleep late. Express Yourself Drawing I like to draw! Hobbies 1 year ago “you do realize the c-stick is smaller than the normal stick, right?” Toad. Im very certain anyone smarter than you on this site knows that. IAmRalsei Forum Leader Hidden Achievements First Year My account is over 1 year old Website Expert Programmer Programming no longer gives me any trouble. Come to me for help, if you like! Programming Strength Edited 1 year ago i'm smart. The square root of 64 is 8 also thank you for calling me toad Autz64 QSP Contest 1 Winner I won the first SmileBASIC Source QSP Contest! Programming Contest End of 2017 Contest Participant I participated in the SmileBASIC Source End of 2017 Contest! Programming Contest Deep Sleep Hidden Website 12 months ago This is embarrasing, but I found the error. On line 5638 you have the following code: PY#=PY#-(STYEY#*3*(GLOBAL_SPEED#+PLAYER_SPEED#)) Replace STYEY# with STYEX# It took me a while to realize this. Imasheep Pokemon Is Awesome! I love Pokemon! Express Yourself Night Person I like the quiet night and sleep late. Express Yourself OSP Contest 2 Contest Participant I participated in the second SmileBASIC Source OSP Contest! 1 year ago Games inside games? Thats as crazy as a spoilerin a spoiler... So crazy,It might work! And i does! IAmRalsei Forum Leader Hidden Achievements First Year My account is over 1 year old Website Expert Programmer Programming no longer gives me any trouble. Come to me for help, if you like! Programming Strength Edited 1 year ago a game inside of a game inside of another game? that's as crazy as a spoiler in a spoiler inside of another spoiler...so crazy, it might you clicked it STOP CLICKING THOSE BUTTONS! i'm dying... here's a choice *dies* i'm okay. i'm alive. you can now press this button. you clicked it... DaSonicMario couldn't find one. aaaaaaaaaaaaaaaaaaaah *dies* someone Imasheep Pokemon Is Awesome! I love Pokemon! Express Yourself Night Person I like the quiet night and sleep late. Express Yourself OSP Contest 2 Contest Participant I participated in the second SmileBASIC Source OSP Contest! 1 year ago I clicked all the buttons IAmRalsei Forum Leader Hidden Achievements First Year My account is over 1 year old Website Expert Programmer Programming no longer gives me any trouble. Come to me for help, if you like! Programming Strength Edited 1 year ago why did you kill DaTailsLuigi twice? Imasheep Pokemon Is Awesome! I love Pokemon! Express Yourself Night Person I like the quiet night and sleep late. Express Yourself OSP Contest 2 Contest Participant I participated in the second SmileBASIC Source OSP Contest! 1 year ago becauseIClickedallthebuttons...And I did itbecauseIcanHow do give spoilers names IAmRalsei Forum Leader Hidden Achievements First Year My account is over 1 year old Website Expert Programmer Programming no longer gives me any trouble. Come to me for help, if you like! Programming Strength Edited 1 year ago here's how to give spoilers names: first we only need the first half so GET THAT SECOND HALF OUTTA HERE! (and add a space right before the right bracket so it doesn't count [spoiler ] ah yes thank you add an equals after the spoiler (now a space will be AFTER THE LEFT BRACKET so it doesn't count with the equals) [ spoiler=] then after add the name of the spoiler [ spoiler=Cat] also DO NOT CHANGE THE SECOND HALF! THE SECOND HALF SHOULD ALWAYS BE [ /spoiler] so if you do it as directed you'd get [ spoiler=Cat][ /spoiler]. 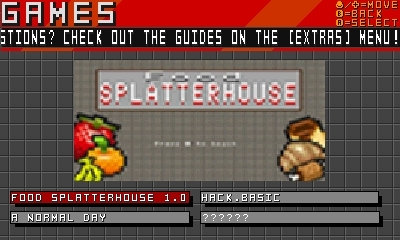 to fix this, remove the spaces (the equals does support spaces btw) now we have our completed named spoiler why did you click this?mmkay Autz64 QSP Contest 1 Winner I won the first SmileBASIC Source QSP Contest! Programming Contest End of 2017 Contest Participant I participated in the SmileBASIC Source End of 2017 Contest! Programming Contest Deep Sleep Hidden Website 1 year ago You can't get out from Hack.Basic yet. And A Normal Day needs you to reach at the very end Imasheep Pokemon Is Awesome! I love Pokemon! Express Yourself Night Person I like the quiet night and sleep late. Express Yourself OSP Contest 2 Contest Participant I participated in the second SmileBASIC Source OSP Contest! 1 year ago what does it eve MEAN THO Autz64 QSP Contest 1 Winner I won the first SmileBASIC Source QSP Contest! Programming Contest End of 2017 Contest Participant I participated in the SmileBASIC Source End of 2017 Contest! Programming Contest Deep Sleep Hidden Website Edited 1 year ago Means that the only means to escape from those games quickly is pressing START, which is like pressing the power button of a computer. Imasheep Pokemon Is Awesome! I love Pokemon! Express Yourself Night Person I like the quiet night and sleep late. Express Yourself OSP Contest 2 Contest Participant I participated in the second SmileBASIC Source OSP Contest! 1 year ago the games in games made my phone explode spaceturtles Video Games I like to play video games! Hobbies Avatar Block I didn't change my avatar for 30 days. Website Intermediate Programmer I can make programs, but I still have trouble here and there. Programming Strength 1 year ago you wasted your time Autz64 QSP Contest 1 Winner I won the first SmileBASIC Source QSP Contest! Programming Contest End of 2017 Contest Participant I participated in the SmileBASIC Source End of 2017 Contest! Programming Contest Deep Sleep Hidden Website 1 year ago Eversky_HD Minecraft Is Awesome! I love Minecraft! Express Yourself 1 year ago Go to my Profil and click on 'Paper Minecraft'. It was hard to working. ChaseCZ Intermediate Programmer I can make programs, but I still have trouble here and there. Programming Strength Video Games I like to play video games! Hobbies Zelda Is Awesome! I love The Legend Of Zelda! Express Yourself 1 year ago I'm calling 911 IAmRalsei Forum Leader Hidden Achievements First Year My account is over 1 year old Website Expert Programmer Programming no longer gives me any trouble. Come to me for help, if you like! Programming Strength Edited 1 year ago *CLICK HERE* ChaseCZ Intermediate Programmer I can make programs, but I still have trouble here and there. Programming Strength Video Games I like to play video games! Hobbies Zelda Is Awesome! I love The Legend Of Zelda! Express Yourself Edited 1 year ago i've already seen this, but who cares... I need a doctor IAmRalsei Forum Leader Hidden Achievements First Year My account is over 1 year old Website Expert Programmer Programming no longer gives me any trouble. Come to me for help, if you like! Programming Strength 1 year ago Super Autz64 DS spaceturtles Video Games I like to play video games! Hobbies Avatar Block I didn't change my avatar for 30 days. Website Intermediate Programmer I can make programs, but I still have trouble here and there. Programming Strength 1 year ago All my notifications were wasted on this place. IAmRalsei Forum Leader Hidden Achievements First Year My account is over 1 year old Website Expert Programmer Programming no longer gives me any trouble. Come to me for help, if you like! Programming Strength 1 year ago you have 5 hours before you get more notifications. spaceturtles Video Games I like to play video games! Hobbies Avatar Block I didn't change my avatar for 30 days. Website Intermediate Programmer I can make programs, but I still have trouble here and there. Programming Strength 1 year ago Only one of my four were on this thread. HA Imasheep Pokemon Is Awesome! I love Pokemon! Express Yourself Night Person I like the quiet night and sleep late. Express Yourself OSP Contest 2 Contest Participant I participated in the second SmileBASIC Source OSP Contest! 1 year ago I just noticed ToadisTheNest changed their username snail_ QSP Contest 1 Contest Participant I participated in the first SmileBASIC Source QSP Contest! Helper Received for being very helpful around SmileBASIC Source Achievements Amazing Contributor Someone thinks I'm an awesome person who has done so much for the community! Achievements 1 year ago Save data should really load automatically instead of having to press LOAD every time (keep the load button though, it could help in the event of a weird bug, maybe.) You could use CHKFILE to make sure the data file already exists, but you probably know that. Autz64 QSP Contest 1 Winner I won the first SmileBASIC Source QSP Contest! Programming Contest End of 2017 Contest Participant I participated in the SmileBASIC Source End of 2017 Contest! Programming Contest Deep Sleep Hidden Website Edited 1 year ago At first i was thinking about, if the player wants to start a new game from scratch (for whatever reason), he would just need to overwrite the save with the data he currently has, instead of manually going to the DELETE function of SB menu. That's why you always start with nothing. But well, i think is somewhat nonsense, so i ended up adding what you said. Also, keep in mind that high scores from Free Mode won't save, yet. snail_ QSP Contest 1 Contest Participant I participated in the first SmileBASIC Source QSP Contest! Helper Received for being very helpful around SmileBASIC Source Achievements Amazing Contributor Someone thinks I'm an awesome person who has done so much for the community! Achievements 1 year ago You could always add a data reset option in the game. Autz64 QSP Contest 1 Winner I won the first SmileBASIC Source QSP Contest! Programming Contest End of 2017 Contest Participant I participated in the SmileBASIC Source End of 2017 Contest! Programming Contest Deep Sleep Hidden Website 1 year ago Yeah. That could work. Thanks for the suggestion. Weirdo 1 year ago Neat! Though....when will the Maps and Guides sections of the shop become aviable? 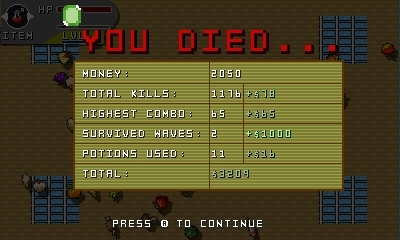 Also, during my first round I had unlimited potions of every type. Either I just didn't look, or is it supposed to be like that? Anyway, great game. Certainly worth the wait. Weirdo 1 year ago Also, for some reason the stat changes in free mode also affect arcade mode. Don't know why. Autz64 QSP Contest 1 Winner I won the first SmileBASIC Source QSP Contest! Programming Contest End of 2017 Contest Participant I participated in the SmileBASIC Source End of 2017 Contest! Programming Contest Deep Sleep Hidden Website 1 year ago Also, for some reason the stat changes in free mode also affect arcade mode. Don't know why. Fixed, thanks for that. Also, you don't have unlimited potions, you just have too many potions. 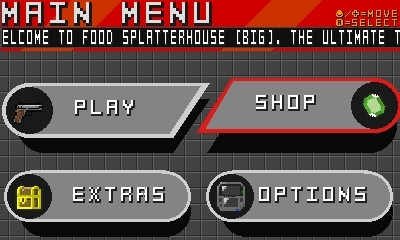 And last: the shop will be complete on the next build, which is the "Final" version of the game. See the post description for more details KingCo Avatar Taboo I didn't change my avatar for 180 days Website RNG Hidden Easter Eggs Intermediate Programmer I can make programs, but I still have trouble here and there. Programming Strength 1 year ago Yay! Finally!